A popular Nashville comedian has made a very nice living off of one gig. He uses the expression “Here’s Your Sign” and says stupid people ought to be required to wear them. That way they are easier to spot. Same with bus owners, we should all get a sign the day we plop down the hard earned cash for one of these behemoths of the open road. It is my profound hope that somewhere, there might be a cure for stainless steel fever, but I don’t think so. In my own case, I don’t think there is much that can be done, I am shot full of it, and there seems to be no known cure. When the coach failed to start, and was rather stubborn in turning over, I was told, “Oh, it has just been sitting on the lot for a long time, once you get it out on the road, that will all clear up.” Forty miles west of Birmingham it cleared up, three new coach batteries at a cost of $167 each. There is something about traveling that naturally appeals to me, the mere fact that you can get out of town for a little respite, is also a mark on the plus side of the scale. Something about listening to the music that you want to hear on the CD player, the vision of something new everyday unfolding before you in the windshield, different smells, different locations. The chatter of truckers, the modern day Flyin’ Dutchman of our culture on the CB and the sound of static, much like bacon frying on an open fire, all of these things appeal to me. Nice to get away from all the things that irritate me, all those pesky little nuances in life, that stick in one’s craw, as they relate to it in my neck of the woods. No computer problems for at least two weeks, no shut downs, no installations of this and that, which always seem to come at the absolute wrong time. It was nice. So, not knowing any better, I decided to document my adventure in bus ownership. I took some photo’s with my cellphone, BIG MISTAKE, yesterday I was a little bit over two hours trying to download them from my phone to my computer! Tech support: What seems to be the problem sir? Customer: Whenever I press the backspace key, the letters I typed seem to disappear. Ah, the open road, bus shoppin in the sunshine state, what could be better? Florida seems to be deader than a door-nail, almost to the point of being legally declared a disaster zone as far as tourism is concerned. No problem finding a room, plenty of vacancies and the usual tourist haunts, were void of the crowds and throngs of the hurried, pushy and rude, jostling to get to the front of the line. Being as I am a big fan of Denny’s restaurants and The Cracker Barrel, a fast food aficionado I surely am, I got my fill of the quick, greasy and deadly on the trip. Who says there are no adventures left in life at age sixty-two? We both laugh halfheartedly on that one, and then he points me in the right direction. I did get hit up quite a bit by panhandlers on this trip, but I suspect that is because of the economic blight that happens to be on the land, that seemingly will never go away. Most of the trip from here on out, is rather uneventful, the generator quit on me in Alabama. I spent the night in Mississippi with every known mosquito in three counties. I ran over five curbs and moved one really BIG ROCK outside the T&A in Memphis. Crossing one more un-named big muddy river, the old bus lurched from side to side something akin to Shamu the Killer whale. The rich red Oklahoma countryside loomed prominent in my sight, and I could tell I was once again home. You can always tell when you hit that Grape’s Of Wrath Oklahoma Line. The wife gets bitchy, the kids start to fight with each other, and you have this overwhelming urge to siphon some gasoline. Welcome to Oklahoma, please set your watch back fifty years. Never forget that ordinary life can also be quite extraordinary if you remember to be grateful for what you already have. If you are one of the few fortunate souls left in the country that can actually “afford to get away and see a little vacation time materialize among the wreckage of man” take the opportunity to get out and about. It will heal what ails you. 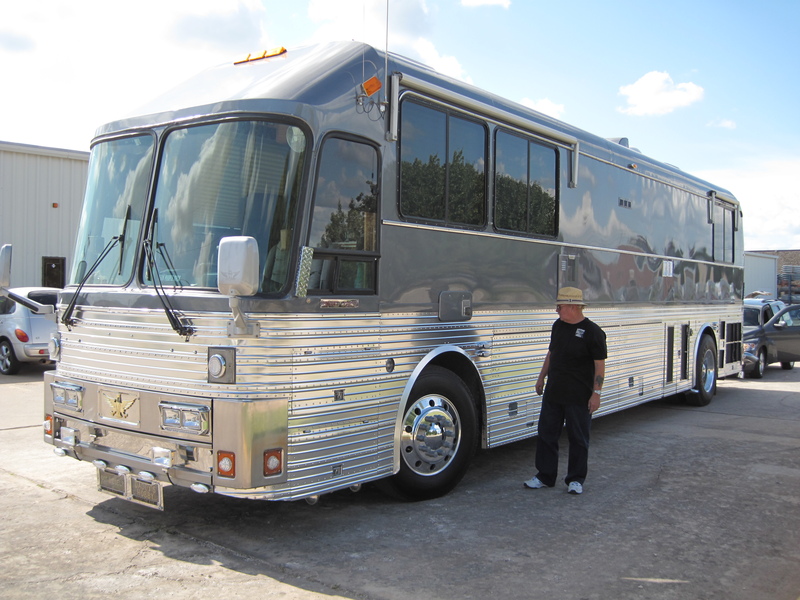 * This article was first published in Bus Conversions Magazine.